I have a new layout and process video to share with you today! I found a spot of free time and wanted to make as many videos as I can before we move. Here's one! Raise your hand if you have more wood veneer than you know what to do with?! MEMEMEME! 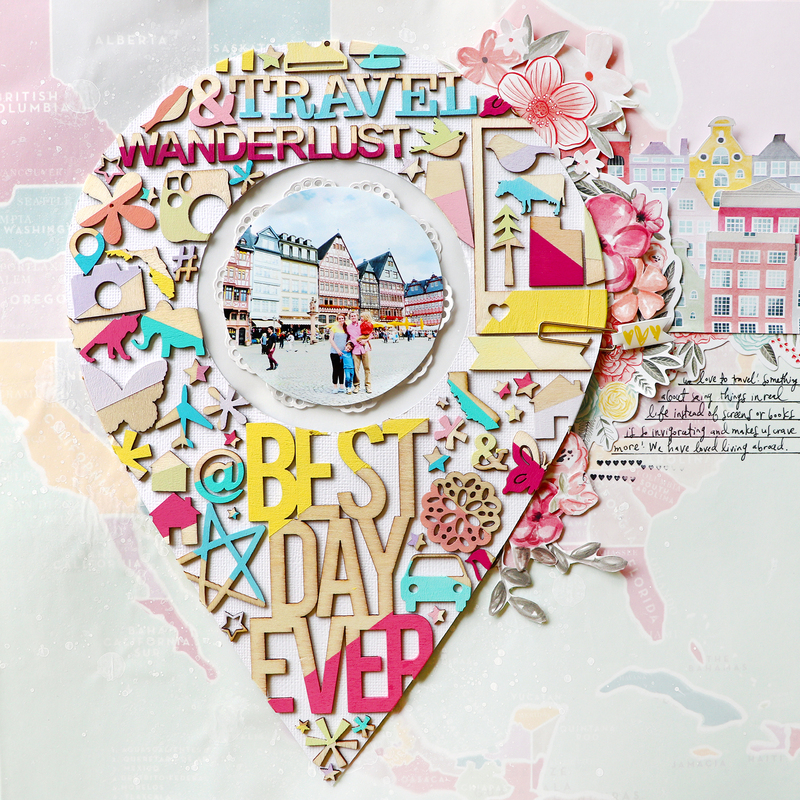 I have a whole box of 'em and so for this layout I decided to give a few of them a makeover by painting them for the "dipped paint" look and then use them as fun embellishments on a travel-themed page. Figuring out what to do with all of the wood veneer took some thinking, I wanted to use all of them since I had just spent a couple hours making them, so the best way I could think of was to use them in a large shape and a geotag seemed to fit with the travel theme. The layout came together and evolved from there which you can watch in the process video below. I hope you are inspired to try painting your wood veneer and giving them new life! Just when I think you can't outdo yourself. you make this! I LOVEEEEEEEEEEEEEEEEEEEE this! LOVING what you did with those wood bits!!! Pinning this!!!!!!!!!!!!! You are AMAZING, simply AMAZING! Ditto everything JTW said. I am so lifting this idea!